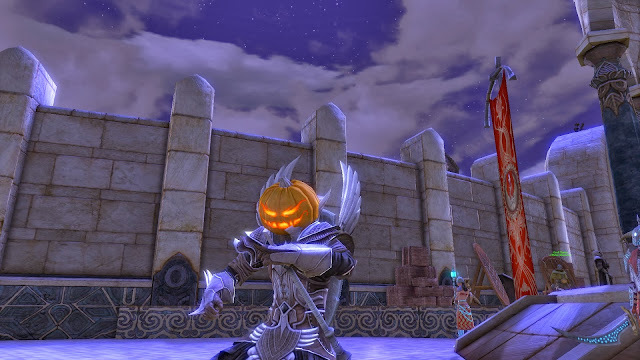 ECTmmo.com- MMO Blog: The Adventures of Kaozz...: Happy Halloween! So many fun events this month, trying to enjoy a few of them at least! I find myself strapped for time these days, so I want to play what is offering the most for this month. Most bang for the buck! Which game isn't going to dollar me to death for cool Halloween items? Which game is going to actually update the events? I've tried most of them out over the years. I very much want to mess around with some new events like Neverwinter has, but it just boils down to time. So what looked the most appealing this year? I decided to pop into GW2 and Rift, see how the events were rolling. I am trying to fit in EQ2, which really has the best events around, but I just need to sink so much into my second account with an expansion or unlocks, I will get around to it eventually. Plus the pull to purchase a Halloween themed house... I haven't though. Sort of leaves me feeling, meh because I need to unlock so much. Rift is always fun, I just seem to drift off because Dire won't play it much. But it is still a very enjoyable game. I love the cosmetic side, the rifts out in the world and the housing is a nice plus as well. It is fun to decorate dimensions and there are a lot of awesome items to fill them with. I've been playing around on the cleric, I really love the class. I also find with my newer video card I enjoy the game more, feeling more pulled into it by the sheer beauty of the game. I hear a lot of people say they feel a disconnect with the game, I felt the same with the lower settings. It felt bare, now I feel more immersed out in the world. The Halloween event in Rift has been pretty laid back, I don't feel rushed or like I can't keep up. I started out late but it was nice to be able to participate in it for a few days! 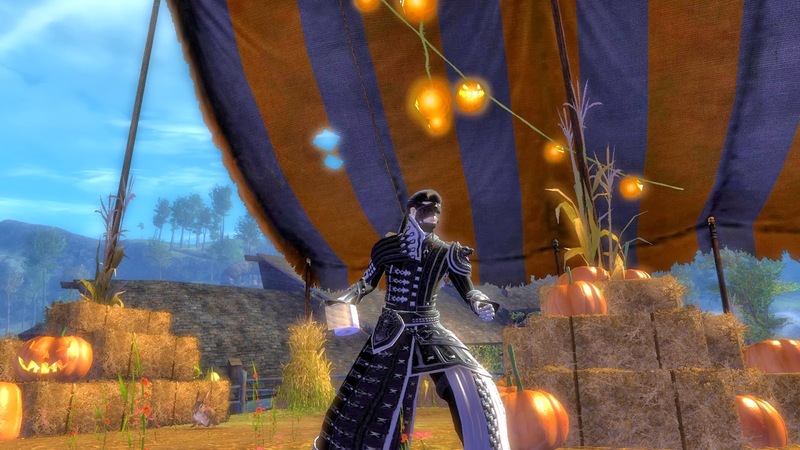 I've also gotten some cool costume items. This year they have some great additions like going headless! Pumpkin heads, corgi heads, unicorn heads... Funny stuff to build a costume with! Plus, the Halloween items are available in the shop and in game, I don't feel like I am missing out. 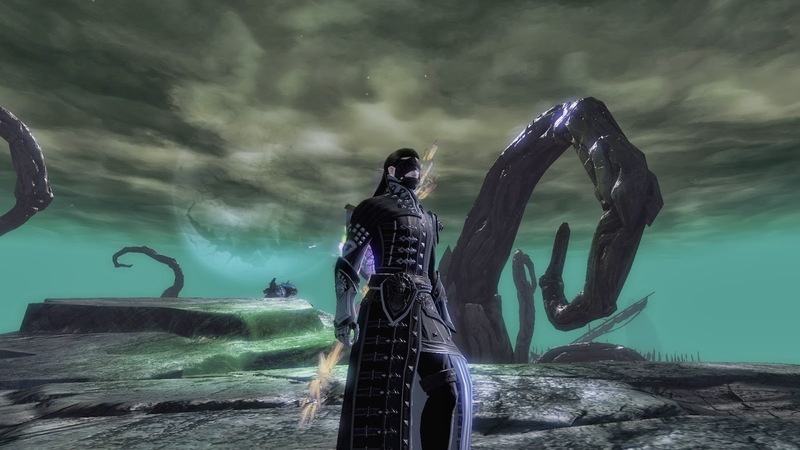 GW2 feels more of a faster pace. The clock tower, the instance, the maze. It all feels like a rush, a blur, but it is a fun rush. The mobs in the maze hand my arse to me if I get into the overflow (oh noes all alone!! ), best to keep with the zerg. Even at 70 with really nice gear, I sunk a good bit into armor for a change, I still can have trouble. There are just too many mobs packed in all over. The event is fun, I didn't do the questline yet, I'd like to since I am much higher in level this year. I just don't know if I will be able to fit the time in. It has been nice to poke my head in and play for the event, I just love the atmosphere for it! The art team did a stellar job on it and I can't get enough screenshots, lol. The one downer is that the cosmetic staff that I wanted last year is still behind a lockbox, which is random. Not even guaranteed anything decent in the box, a real turn off to even buy one key, after last year I didn't even bother. I checked the auction for it, 400g, way out of my budget for a freaking skin. I read there is another way to get permanent skins, I suppose I should look into it. And, yeah, WoW totally bombed for this event. Fastest way to push me to another game. Some people love to raid, some people love to PvP. I love fluff and special, holiday type, events. At least we'll get a cool little skeleton pet in a few days. So, those were the most appealing to me, personally. 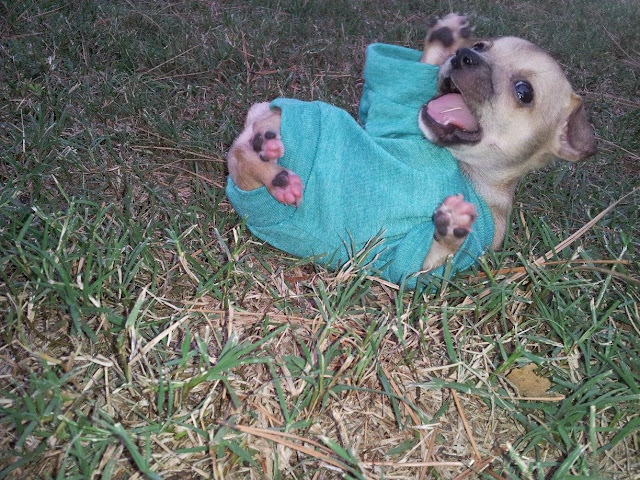 My free time is also being shared with a new addition to our zoo family, Bella-My tiny, teeny, little chihuahua puppy. She is so darling! She still sleeps a lot, like an infant. This little girl has a big personality for such a little thing! And... our lost ferret showed up today, I received a call this morning, half asleep, pondering if I should answer. My son is ecstatic. I feel like a zoo keeper some days, lol. In addition, someone felt bad he lost his and gave him one that was lost and they had found... So we now have two. Double trouble! Maybe I'll hand out animals instead of candy for Halloween.... Just kidding! Have a safe and fun Halloween, boils and ghouls! Meet Bella... She is hilarious. This is her rolling around getting her clothes all dirty! Happy Halloween. Totally agree about WoW, they really need to revisit their festivals every year, even if it's only a new decoration type and a re-colour of the Feline Familiar. Ty, Erinys! Glad someone agrees with me, hehe. I always feel like I'm the only one sulking in the corner over events.